Recently, we've been receiving multiple Requests for Proposals (RFPs) from various media buying agencies. While this isn't uncommon, and while these RFPs usually seem rather promising, we tend to decline participating more times than not. Why? The dreaded media spreadsheet. Now I understand that media agencies need a way to compare apples to apples in order to make an appropriate recommendation for their clients, but influencer is simply not in a position to comply with that right now. There are no IAB standards like there are in banner ads and the like for influencer yet. And because of that, the way Carusele counts influencer impressions is different than the way another agency is. The way Carusele optimizes content is different than how another agency does it. 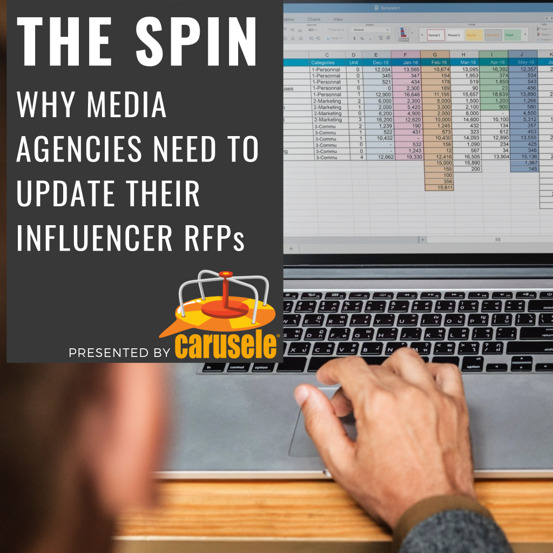 The way Carusele ensures the influencer's audience is the right audience is different from the way another agency does it. And a spreadsheet doesn't allow for any of those differences. For each and every influencer, they want to know how many pixels by how many pixels each piece of creative would be. How would we be tagging the content (and there was no choice for other). How would we be serving the ads. Would it be double click or another ad server? None of that applies to influencer marketing. So this was a challenge where we couldn't fit that proverbial square peg into that round hole. As influencer marketing goes from a billion dollars last year to two billion this year and 10 billion shortly after that, media agencies have a role to play that will increase in size. But until either the industry standardizes or media agencies take the time to understand the difference in methodology from one agency to another, they're not putting themselves in a position to make a solid recommendation to their clients. If you're looking to issue an RFP or would like to see what a custom influencer proposal would look like for your brand, contact us today and we'll set up some time to chat!